Home Urantia Book Dinosaurs and Jesus in the Same Book? Can you imagine a single book that contains dinosaurs AND Jesus? It's here! And if you like science and love God, you need to read this book! The Urantia Book spans ALL of human history - from the earliest beginnings of our world and its evolution - including dinosaurs - and is crowned by the most sweeping and inclusive accounting of the life and teachings of Jesus found anywhere. Science and Religion Finally Reconciled? The Urantia Book satisfies the desire to make sense of science and religion and to reconcile these two topics as never before. There is no conflict with these two realities of life. Both are God-given and both are interwoven together within Urantia Book teachings. Now, that’s modern and smart religion! The book teaches that the earth is about 4.5 billion years old and that dinosaurs walked the earth 140,000,000 years ago. Man first made his appearance just 1,000,000 years ago - so they never existed together. These facts of human history are brought together in a comprehensive and understandable panorama that includes the facts and the purposes of evolution: creation in time and space. Dinosaurs - Where do They Fit In? Dinosaurs have played a part in the evolution of life on our world; they just played their part long before human beings evolved. Mankind is the crown of evolution – the crown of God's earthly creation; dinosaurs were relatively temporary scaffolding in the evolutionary ladder. 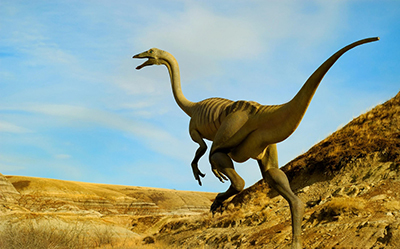 WHEN and WHY Did Dinosaurs Disappear? The story of the first two human beings is one that will thrill and amaze you. It is a story of awakening intelligence, bravery, courage, tragedy, adventure and triumph. It is history; it is OURstory. 62:5.1 “From the year A.D. 1934 back to the birth of the first two human beings is just 993,419 years. “These two remarkable creatures were true human beings. They possessed perfect human thumbs, as had many of their ancestors, while they had just as perfect feet as the present-day human races. They were walkers and runners, not climbers; the grasping function of the big toe was absent, completely absent. When danger drove them to the treetops, they climbed just like the humans of today would. They would climb up the trunk of a tree like a bear and not as would a chimpanzee or a gorilla, swinging up by the branches. And Where Does Jesus Fit In? Part IV of The Urantia Book – The Life and Teachings of Jesus. This is the whole story - the real story of Jesus. We learn of Jesus’ true identity before he came to earth, what happened while he was here, and where Jesus is today. After all the preparation in the first three parts of the book, we are presented with a new – and fully accurate – restatement of the entire life of Jesus, the teachings that he brought to humanity, and the inspiring example of an incarnated Divine Son of God housed in human form who lived a full life dedicated to revealing the true nature of God the Father.